Long time ago, there was a couple who lived in the coastline which is now famously named as “Bas Daku”. They had a beautiful daughter named “Dabong”. They got her name from her fair complexion and a transparent throat whereby food that was being eaten could be visibly seen. Her beauty was known far and wide. Many suitors came to win her heart. One day, Kang, a fisherman from Tobod, Jagna happened to be fishing along the coast of Bas Dako saw Dabong basking in the white sand. With her long hair flowing from the waist and her innocent glare, he was instantly captivated. When he reached the shore, he was still startled by the mesmeric beauty of Dabong. Dabong likewise felt the same as he saw the young gentleman. Kang greeted the young lady and abruptly expressed his irrefutable feelings. That was the beginning of their love affair. At last a date was fixed for their wedding. And during the time, it was a custom for a fiancé to do menial chores at the fiancée’s home before his wedding. One early evening, Dabong’s father requested Kang to go with him to Camiguin Island. Not to disappointment him, he obeyed and took Dabong to Camiguin Island too. Upon arrival, Kang saw a biyasong (orange-like fruit which was used to brawl beast) and inertly took it in his pocket. When the father and Dabong came back a newly buried corpse was brought by him and ordered him to ride again. Not even had gone far, the curse started to fuel up and they fainted. Kang was surprised what happened, but the father asked him if he took anything in Camiguin and he fiercely ordered Kang to throw away what he took. With great surprise, he abruptly threw it. At last, they reached home and a sumptuous meal was prepared. But that moment, Kang became anxious and want to unveil the mystery of his fiance’s family. Because he was frightened that the meals were human flesh, he pretended to have stomach ache in order not to eat. The following morning, he was about to take a bunch of huge fishes for home. When he decided to use the fishing gears of Dabong’s father, he was outraged what he saw. He discovered organs of men, hands and limbs of a person in enclosed containers near the gears. So he decided to go back home and became hysterical that and plan a horrifying move. “This is the kind of wife I will have”, he said to his parents. A dreadful plan was at hand to kill the family of Dabong. During the wedding day, instead of rice, pigs, cow and wine to be brought, spears, lances, pointed bolos and shields were packed in sacks and massacred the helpless family of Dabong. But before Dabong was killed, she cursed the place to be withered. The late generation called the barrio Kangdabong and now refined into Candabong from the two important persons Kang and Dabong. Presently, the Barangay is now a fast growing community in Anda due to its potential tourism industry. 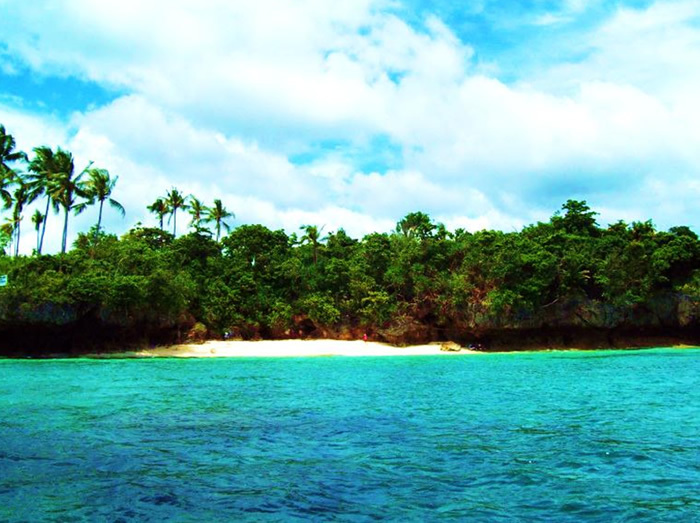 Barangay Chairman NEMESIO G. TINIO JR.
BEACH COMBING – There are several beaches dotting in Barangay Candabong. The best site to work on your tan, read a book and surely these are the places that beckon of long lazy days and tranquil nights. These resorts feature bright, fine sand and clear waters. CAVES – Over 10 major and minor caves are carved by Mother Nature beneath this barangay and the centuries have decorated it with breath-taking formations. A mixture of both eerie and ancient enchantments continues to cast their spells on caving enthusiasts who come to visit. One of its popular caves is Sarah Cave. This cave is considered as one of the most challenging caves in town because rappelling is how you gain access to it. Definitely, this one is not for the faint-hearted. STA. CRUZ FIESTA CELEBRATION – Held every May 2-3, highlights are Grand Disco, Nightly shows, Sports Fest and the centrepiece program- the Coronation Night of Miss Candabong. THE SPIRIT OF CHRISTMAS IN BARANGAY CANDABONG – Yuletide cheer carols garnished with the rhythms and flavors of tradition, homes and gardens twinkling with the season’s best wishes in Barangay Candabong. Grand Christmas Party and Disco at the Barangay Proper will be the highlights in celebrating the holiday season.